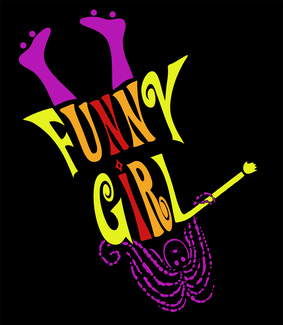 The Concord Players is excited to open its 100th season with the 1964 classic, Funny Girl. Auditions will be held at 51 Walden on May 8 and 9 at 7 PM with callbacks on May 12 at 6 PM. Actors should sign up for one slot and prepare 16-32 bars of a song from musical theater in the style of the show, but NOT FROM Funny Girl. The initial audition will consist only of a singing audition. Movement and acting auditions will happen at the callback. Please, fill out the Audition Sheet and bring with you to the auditions. For extra information about a performance at Concord Players click here. Rehearsals will begin in late August or early September 2019 and be Sunday, Wednesday, and Thursday evenings with some Fridays. Performances are November 8. 9, 10 (matinee), 15, 16, 17 (matinee), 22 and 23, 2019.
entertainer from New York’s lower east side, quirky, fearless, comedic finesse, acting range from impassioned teen to major star, good mover. tough Brooklyn/Jewish mother, dry funny. a gambler and the love of Fanny’s life, suave, sophisticated, and charming; must have a strong middle range voice, baritone. a song and dance man and Fanny’s closest friend, good comic timing, bright, energetic, sincere; must be a strong singer/dancer who taps. Mrs. Brice’s poker playing crony, strong, shrill yet funny. another of Mrs. Brice's cohorts, a comedienne. the 4th in Mrs. Brice's quartet of friends; Irish accent. the famed Broadway producer, elegant and distinguished, imposing, resonant, distinguished, the producer of the Ziegfeld follies; this is a non-singing, non–dancing role. Fanny’s dresser and confidante, the voice of reason, meek yet strong; may double in the ensemble. a theatrical agent, Urbane; strong acting skills, must double in the ensemble. sings "The Most Beautiful Bride In The World," high production style tenor. Auditioning only for the role of Florenz Ziegfeld, Jr.